10 Practical Tips for Correct Test Weight Handling - - Download the free weight handling poster and learn how to use, clean and store test weights. 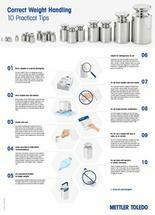 Download the free weight handling poster and learn how to use, clean and store test weights. How you handle test weights can make a big difference in their accuracy. 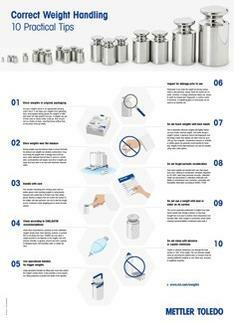 The poster with 10 practical tips for correct weight handling is a helpful support and reminder for routine balances and scales testing in every lab. Weights are the most frequently used and most important equipment for testing scales and balances, and as such, weight handling need to be treated with care. How you handle, clean and store test weights can make a sizeable difference in the ongoing accuracy of your weighing processes. Test weights are an indispensable resource for testing and calibrating scales and balances - and they require manual handling. As such, issues such as skin oils, dirt and shifting ambient temperatures can affect their accuracy. When these issues are not addressed, operators may conduct tests with inaccurate weights, resulting in weighing errors as well as costs associated with rework, waste disposal, and product recall. Fortunately, a simple series of 10 practical strategies including choosing the right storage techniques can help you protect the usable life of your test weights and avoid inaccuracies.